Super tough groundcover with deep green trailing foliage covers everything in its path completely. Double yellow flowers make an outstanding show in summer. Use as hillside blanket, around evergreen shrubs or as a lawn substitute. Shear back blooms to keep tidy. Drought tolerant. 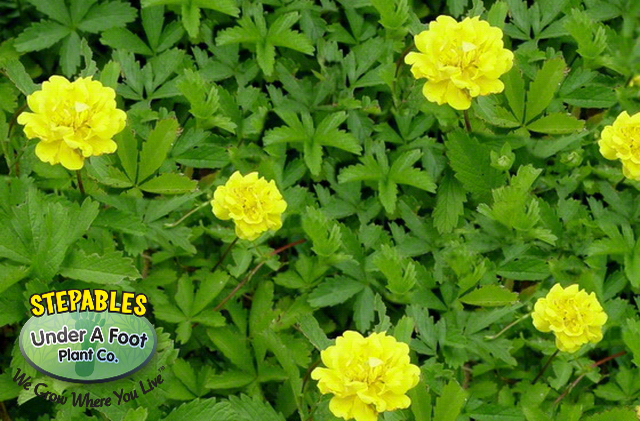 Potentilla Plenifloris is a perfect plant to put around shrubs that need to be managed from time to time. It will keep the weeds down and allow you access to trim shrubs. It’s easily trimmed back and will push lateral growth when cut back.